"He's very happy at the moment"
Stuart Lancaster and Leinster are in a very happy relationship "at the moment", according to Leo Cullen. The former England boss, who departed the role in the wake of the 2015 World Cup pool exit, has been linked with a return to his homeland. England are on the look-out for a coach to join their set-up after next year's World Cup and RFU interim chief executive Nigel Melville stated this week that Lancaster's history with the side would not rule him out of contention. Asked if Lancaster, who has been commuting from England since taking the senior coach job at the province in 2016, had given any hints about his future intentions, Cullen said: "He's telling me he's very happy at the moment, anyway. That's all we can work on at the moment. "Stuart has had a huge impact on us as group and we're all very happy at the moment the way the dynamic is working. "We'd be hopeful [he'll be here next season], yes." Cullen brings his European champions to Bath tomorrow for a Pool 1 clash on Saturday. He said that Jack Conan, Rory O'Loughlin, Dan Leavy and Jordan Larmour, who were all on the assessment list on Monday, are still in contention for selection. Leinster are favourites to take the points off a Bath side with just three wins from nine games in the Premiership. However, Cullen admits that their reputation precedes them and that being European champions means that they are a prized scalp - as demonstrated by how Toulouse celebrated their victory in October. He said: "A couple of games we've lost this season, [in the Pro14] against Scarlets, it was a big thing for them. We saw it against Toulouse. We need to understand that [the target] is there and figure out what our own motivations is going into the game. "We understand what it feels like when we don't win the games. We've had a couple of reminders this year already what it's like when we lose and it's not particularly enjoyable." 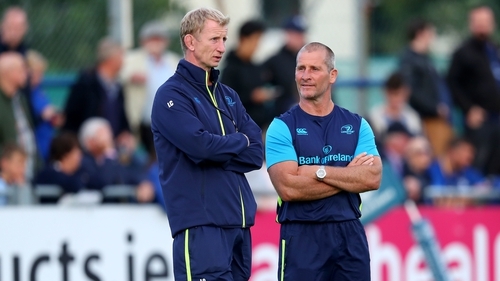 Leinster will also have to deal with former coach Girvan Dempsey, now working with the English side. Cullen said of his former colleague: "It's [his] knowledge of the way we are trying to play the game], the way we set up on both sides of the ball, in an attack and defence point of view, where we've been exposed and where we're potentially a little bit weak. "Girv knows the players inside out so anyone who has that level of detail , you have to be very conscious of that. "[But] sometimes even if teams know what's coming, they still have to be able to handle it."